I love animals dearly and have taken in more than one stray, abandoned pet, and wounded wild animal in my time. It’s a lifelong habit I learned from my mom, trying to save things. Dogs, cats, birds, turtles, fish, frogs, rabbits, snakes – be they large or small, I never discriminate. I have learned the hard way, as most of us do who have tried, that you can’t save them all. But I have also learned that saving just one can make all the difference in the world, even if it’s only for that one animal or yourself. 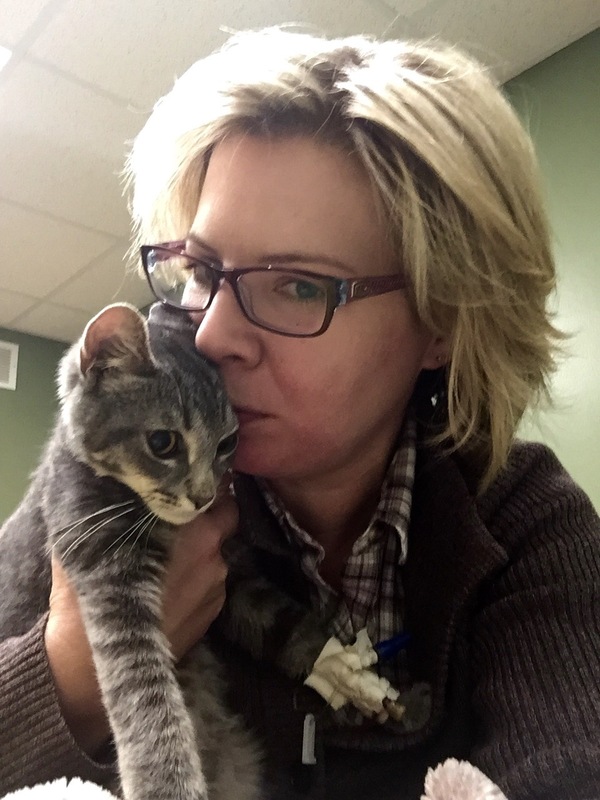 This past summer I adopted two kittens, gray fur–balls found mewling and alone by a kind-hearted woman named Barb and her husband, Josh, at their camp on a nearby lake. Technically, their dog found the kittens. Luckily she is a loving and intelligent retriever who let her owners know she had made an interesting discovery over by the barn. Barb and Josh could not keep the kittens, however, because their adult cat would not be pleased with the additions sticking around for too long. I learned of their plight through our mutual friend Laura, and agreed to come see them. I had only one remaining cat at the time, Ella. My two others, both in their late teens, had died within the last two years. Both had suffered at the end of their lives, and it had taken me a long time to get over their losses. Now, I felt ready. And I figured there was plenty of room for one (or even two) more. It had been a very long time since I raised a kitten – about 15 years – and never two at once. But I couldn’t imagine separating them from each other. They had been left to face the world together, whether by accident or intent (sometimes a mother cat will abandon kittens she thinks aren’t healthy), and I understood they had to be a package deal. I also knew they would be there for each other when Ella decidedly gave them the brush-off. I went to see them on a Friday evening just after the first day at my new hospital job. It was June. Barb and I brought the kittens outside and sat with them in the sunny, warm grass of her yard, flowers blooming all around us. I was tired and a bit stressed from the day, but watching the kittens play made all of that vanish in an instant. Tired out, they eventually came and sat in our laps, fluffy gray faces and tiny, warm bodies snuggling in. It made me so happy, I can still recall the elation. They both looked at me, I looked at them, and I knew I had really come to take them home. Who had I been kidding? They felt so good – not just cute, which they were, but all kittens are cute. It felt more like we belonged together. I imagine it must be close to what new mothers feel when their baby is finally put into their arms after hours of pain and struggle giving birth (minus all that pesky pain and struggle). I could tell Barb would be very sad to see them go, and I felt badly for her. I promised I would take good care of them, and send pictures and email updates. We also agreed to become Facebook friends so I could share posts of their progress. And of course, it wasn’t only for the kittens’ needs – it was also to fulfill mine. I knew they needed a home and a new ‘mom’ to raise them. They were so young they were still eating kitten formula and needing stimulation on their bellies to go to the bathroom. I understood that I needed them just as much – to care for and love them, to have a source of joy and purpose in an otherwise difficult time. So home we all went together. They never cried or complained once on the ride home, which I figured was a good sign. Like they knew they had found the right person. My dogs Hannah and Gordie greeted their arrival that night with curiosity and excitement; Ella was nowhere to be seen. The kittens began exploring the house and playing the second I let them out of their box. No names had come to mind yet. But I was totally fascinated by them, by every look and sound, each little move they made. Everything about them was so small, ears, teeth, eyes, tails, underneath their tails – I couldn’t even tell yet whether they were boys or girls. I guessed they were about 4 weeks old, which the vet confirmed when I brought them in for a check-up a few days later. Being feral, the vet asked me if the kittens were standoffish. No, very friendly, I told him, crediting Barb, Josh, and their dog with giving them a good first encounter with strangers. I think he was surprised. The vet warned me, however, to watch for any problems, worms or fleas and such, and we went over a plan for vaccinations. He also confirmed both kittens were boys. Finally, I could work on some names! Soon after I dubbed them Louis and Clark, after the explorers who had set out from my hometown of St. Charles, Missouri, on their epic journey westward. It seemed fitting. I jokingly called them those names during one of their endless treks around the small utility room where I’d been keeping them, isolated and safe from giant, jumping dogs and Ella’s questionable reception. Though the historical Lewis and Clark (I changed the spelling, yes) weren’t brothers, the names stuck. I could even tell which one would be which. While growing, eating, and playing weren’t any trouble – and even Ella was being nicer than I expected – a short week later Clark was back at the vet. Friendliness is definitely not a problem for Clark; being cautious of his personal safety is. That day he had gotten too close to Hannah, my lab, while she was drinking and she had snapped at him. No bites or blood involved. But she had hit him hard enough with her mouth to fracture his tiny shoulder, as the vet discovered. No treatment was involved, except some pain medicine that made him a zombie (which I later started cutting the dosage of in half; being a nurse, I just couldn’t help myself). Other than that, time and rest were the only treatments. He should heal quickly, though, the vet said. So I set about taking care of my young patient. I spoiled him and comforted him, wrapped him in blankets over a heating pad, fed and watered him by hand, tried to anticipate his every need. I hated leaving him to go to work, and worried constantly about him while I was there. I felt more and more attached to him, ruminating over his injury, imagining losing him. At times, I became quite anxious and depressed thinking I’d failed to protect him. And all the while my bond with him grew stronger and stronger, my determination to see him through magnified. His arrival had saved me from personal pain and suffering, and now I needed so much to save him. More quickly than I’d imagined he recovered, became a young kitten again. My whole body started to feel lighter and relaxed. Little did I know, however, that one injury was just the first in a series of problems we would face together in his young life. While Louis grew like a weed, Clark experienced further troubles: a severe bout with roundworms, then constipation and urinary blockage, a vaccine reaction or upper respiratory infection (not sure which), then more constipation, a bruised jaw (another reprimand from Hannah) followed by prednisone treatment for the jaw (hard on cats’ kidneys and their immune systems), and most recently a week-long hospitalization complete with IV fluids, antibiotics, and blood draws, possibly from a ‘fever of unknown origin’ (not the most reassuring term), or an infection of Bartonella (a flea-borne illness) or Toxoplasmosis (from eating infected rodents or meat). Neither one has been confirmed yet. But thankfully, other tests came back negative for the really scary, cat infectious-disease stuff. Despite daily combing, fleas were a problem I didn’t have a good answer for. Adding to his troubles, Clark couldn’t tolerate any of the flea collars or topical products I tried to put on him, becoming hyperactive and having tremors only minutes after they were applied. Even the natural, ‘bio-energetic’ tags I found online were a wash. Only one in several thousand cats has this problem, and I have one. The products all tell you to bathe them immediately after: Try bathing a hyper, pissed off kitten sometime, who sits shaking and miserable afterward and won’t even let you try to dry him off. Believe me, it’s no fun. It was similarly not fun to visit Clark at the vet last week, seeing him in his isolation cage with his little cone of shame, which he had to wear so that he couldn’t pick at his IV site. Though everyone was kind and the vet updated me continuously, it was heart-wrenching. On my second visit they brought him to me in one of the exam rooms, sans cone of shame, so we could spend more time together. He rubbed his little face so happily on mine that I cried. His neck was shaved from where they drew blood, and a bandage wrapped the catheter around his tiny front leg. But he seemed brighter, more active, helped by the antibiotics. And they had given him a pill that managed to kill the fleas without killing him. He was eating well, but I hand-fed him while I was there – just like that first time after he hurt his shoulder – which he seemed to enjoy once again. The vet and all the other staff were very good to him, and hoped along with me he would get well soon. Fortunately, Clark is home now and on the road to recovery (again). It will be one week to the day tomorrow that I brought him back from the animal hospital, his antibiotic and probiotic regimen is now our daily ritual. He’s himself again, though – playful, loving, full of piss and vinegar. One minute chewing and clawing at my legs, the next rubbing his face on mine and sleeping with me in bed. He is back to running from one end of the house to the other, chasing after Louis, jumping on and off the furniture at seemingly impossible speeds. Gordie is once again the (very tolerant) target of Clark’s odd lovey-dovey moods, where he goes on forever snuggling and rubbing against him, grooming his paws, hopping over occasionally to indulge me in case I feel left out. He even seems to be growing out of his recklessness around Hannah, avoiding her when food is involved and trying not to make a complete nuisance of himself. And she, in turn, seems to understand now he requires a more delicate approach when communicating her disapproval. Louis missed Clark a lot when he was at the animal hospital. A human playmate, even mom, just wasn’t the same. He gave me the look all the time, the “what did you do with my brother?” one. I think even Ella wondered where one of her little minions had gone. Surprisingly, she has come to like them in her way, meaning she tolerates their presence and even deigns to playfully show off for them now and then. And they, in turn, give her the respect she believes she so rightfully deserves. Me, I guess I would say I’m cautiously optimistic. I watch every day for signs and portents, omens of ill will – but so far, so good. Okay, maybe there are some other differences: One is, Clark now often eats his meals (heated to a pleasant temperature) on the kitchen counter instead of alongside Louis and Ella. Spoil him? Yes, you bet, for sure. Guilty as charged. I still pamper him and try to maintain a peaceful, safe perimeter for all when I’m cooking up a meal. And I’m feeding all the animals better food to help them build healthier immune systems (I’m contemplating making it for them myself, eventually). But most of the differences are in me. The animals are still themselves, as they can’t help but be, lacking the often troublesome self-awareness the we humans have. When I first brought the kittens home I never contemplated any of this, never thought, what if one of them has health problems from the start? It’s not what you think about when they are staring up at you with their blue, unfocused, almost alien-like little eyes. And even with all Clark’s difficulties, I don’t regret taking them. Never, nope, nada. They have brought me so much joy along with everything else, it would be impossible to imagine life without them now. Raising them has brought out the true parent in me, I think, and probably as close as I will ever come at forty-two years of age. Fierceness, fear, anxiety, elation, joy, pride, worry, despair – I have run the gamut from one to the other over the past few months. Clark is not as graceful as Louis and probably never will be. He doesn’t always make it to the chair on the first jump, and slips and slides a lot. But it was that way from the beginning. I could tell they would be very different. Louis is like a cheetah, sleek, limber and long, running along the African savannah after some poor gazelle (I could totally see him there). Clark is more like a tank, a tiny one, trying to blast his way through any obstacle, heedless of his size. And the difference in their sizes is pretty amazing. Louis appears almost full-grown next to Clark and is at least a pound or two heavier. Sometimes when they wrestle it doesn’t seem like a fair fight. But Clark holds his own, as he has so far in more ways than one. My friends and I joke that he needs a helmet or a plastic bubble to protect him, like one of those contraptions I used to put my hamsters in so they could spin around the house. I could certainly use one myself sometimes. I mean, who wouldn’t want one, a barrier to keep them or their loved ones safe out in the world? But nothing can ever keep out the hurt entirely. I only wish that were true. So it’s my job as a “pet-parent” (a term I find a bit silly, even if it’s accurate) to try to be that plastic bubble, for Clark, Louis, Ella, Hannah, Gordie, and any other family additions that arrive in the future. And with my track record, it’s pretty much a given that they will. I just have to try to be prepared for the bad, and, simultaneously, appreciate all the good that comes along with them. People always say cats have nine lives. But just in case, I took out a pet health insurance policy for Clark, one that I will happily pay for forever, especially if I never need to use it. I don’t know what the future holds; maybe Clark has spent too many of his lives already. But I keep hoping that my little family and I will get to spend our lives together, happily and healthily, for a very long time to come.